If you get an orange envelope in the mail, you've been sorted into my House! It's pretty much no secret that I'm obsessed with the new Cake Patterns Hummingbird Separates—they were my favorite cover illustration to draw so far, and they are even more fun to sew and wear. 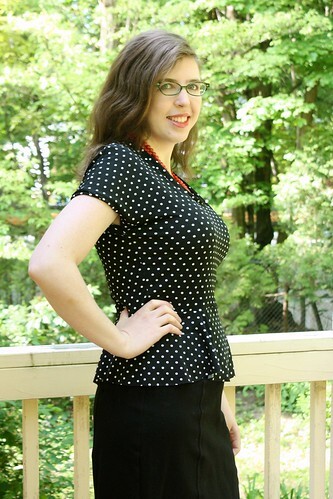 I've made the knit peplum top twice already (in B&W polka dot and an eye-searing bright print, and I'm almost done with my first Hummingbird skirt (in dark pinstriped denim with knit striped piping—will photograph this weekend as soon as I hem her up). Naturally I jumped at the chance to be a Head of House (you get the reference, right? or are the hat and wand too subtle? ), and I got Rufous—the orange envelope team. 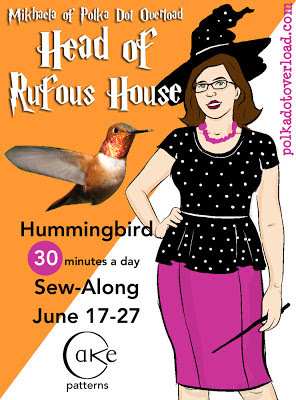 The Hummingbird Sew-along starts June 17(days 1-5 for the top, days 6-10 for the skirt), and you can get your print or PDF patterns here, join the Flickr group for support and fitting help here, and find all the posts and blog badges here. Here's a shipping update and more on the other distinguished Heads of House. Let's get sewing! Are you in? The house with the most official Finished Hummingbird Objects when it's all done gets a lovely prize! Your poster is hilarious! Do you know who gets an orange envelope? Or is it double blind? I have no idea who gets one, it's a mystery! I think they are supposed to be random. My blue envelope arrived in the mail today! I'm in! Awesome! That puts you in Tanit-Isis's house! I can't wait to dig into some Hbird greens, and if they turn out half as nice as yours I'll be happy! I loved both of your fabric choices. And srsly, how much do I have to pay you to make me some signage like that? With just my head or a stick figure?? :) You have skills! Ooh! Everyone in your house is going to have perfect neckline binding! Ha! I do hope so! I love your polka dot hummingbird top and I look forward to sewing along with you soon! Hurrah! We are going to have fun. I was sorted into your house!!! GO Brooklyn Sewing Club!! Mine came in an orange envelope! So excited to make this pattern. My first sew along! I'm in your house! I'm excited to get going! Hurrah! I see you have a (quiet) blog called Melba Made—can I ask you the origin of that name—is it your name? My grandmother who taught me to sew was named Melba so I'm curious!